Origin and Habitat: Cycas desolata is known only from two subpopulations to the northwest of Charters Towers, Queensland, Australia over an area of about 40 km. The species is relatively common, but only found in two subpopulations. Number of mature individuals 1000-2500. Altitude range: Recorded from 450 to 550 metres above sea level. Habitat and Ecology: Populations occur on flat terrain on grazing land and in eucalypt woodland on shallow skeletal soils or low rocky outcrops and is a relatively common plant in its habitat. The threats to this species are unknown. Description: Cycas desolata is a medium to large species of cycad, a palm-like plant usually less than 4 metres tall, but individual plants may occasionally exceed 7 m in height. This species is distinguished from other Australian species by the strongly glaucous, light blue foliage with relatively few leaflets, and the spine-free petioles. The leaflets (pinnae) are narrow (mostly less than 4 mm wide) and the Cataphylls (Modified leaf, much reduced and thickened, serving to protect the apical meristem in cycads produced in flushes preceding the emergence of cones or leaves) are long and pungent. Derivation of specific name: The specific epithet "desolata" refers to the ruinous or desolate nature of the habitat where this plant occurs. Stems: Arborescent, cylindrical, to 4( rarely to7) m tall, 15-25 cm in diameter. Leaves (fronds): Blue when young, aging to dull green, dull, 75-120 cm long, strongly keeled (V-shaped opposing leaflets inserted at 30-50° on rachis), with 90-136 leaflets, with orange or brown tomentum shedding as leaf expands; rachis usually terminated by paired leaflets. Petiole 10-23 cm long, glabrous, without basal spines. Leaflet straight and relatively long, margins recurved, base gradually narrowing. Median leaflets simple, strongly discolorous, 180-210 mm long, 3.8-5 mm wide, inserted at 40-50° to rachis, decurrent for 2-4 mm, narrowed to 2.5-4 mm at base, 1-5 mm apart on rachis; median leaflets section flat; margins recurved; apex acute, spinescent; midrib flat above, raised below. Cataphylls: Linear, soft, densely floccose, 30-45 mm long, persistent and sharply pointed. Male cones: Narrowly ovoid (egg-shaped), orange or brown, 24-40 cm long, 8-9.5 cm wide. Microsporophyll lamina firm, not dorsiventrally thickened, 28-38 mm long, 5-13 mm wide, fertile zone 20-26 mm long, sterile apex 8-12 mm long, deflexed, apical spine prominent, sharply upturned, 3-4 mm long. Megasporophylls: Like other Cycas species, the female plants do not bear true “cones”; instead they carry ovules and seeds on fleshy, megasporophylls that are open leaf-like structures about 13-24 cm long, brown-tomentose; ovules 2-6, glabrous; lamina smal,l broadly triangular to ovate, 28-32 mm long, 20-25 mm wide, obscurely dentate, apical spine distinct from lateral spines, 5-15 mm long. Reproduction: Male cones shed pollen and female sporophylls are receptive in November. Pollination is effected by small beetles in an obligate mutualism. Seeds: Flattened-ovoid, 35-39 mm long, 32-35 mm wide; sarcotesta yellow or orange-brown, strongly pruinose; fibrous layer absent; sclerotesta smooth. Spongy endocarp absent. Related species: Cycas desolata is closely allied Cycas cairnsiana but has slightly wider pinnae (18-21 cm x 3.5-5 mm) and the apical spine of the megasporophyll is 5-15 mm long. The petioles bear few or no thorns. It is also related to Cycas platyphylla and Cycas cupida. 2) Forster, P. 2010. “Cycas desolata”. The IUCN Red List of Threatened Species 2010: e.T41959A10584588. http://dx.doi.org/10.2305/IUCN.UK.2010-3.RLTS.T41959A10584588.en . Downloaded on 19 September 2015. 5) Whitelock, Loran M., “The Cycads”, Timber press, 2002. 6) Haynes J.L, “World List of Cycads: A Historical Review”, IUCN/SSC Cycad Specialist Group, 2012. 8) Hill, K.D. “A preliminary account of Cycas (Cycadaceae) in Queensland.” Telopea 5:177-206. 1992. 10) Forster, P.I. “Cycas desolata (Cycadaceae), a new species from north Queensland. Austrobaileya” 4(3): 345-352. 1995. 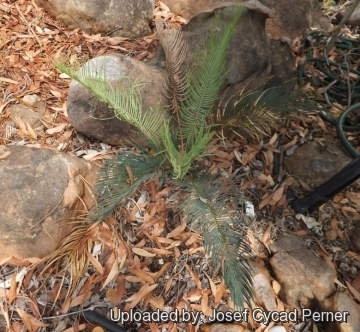 11) PACSOA contributors "Cycas desolata". In: Cycads. 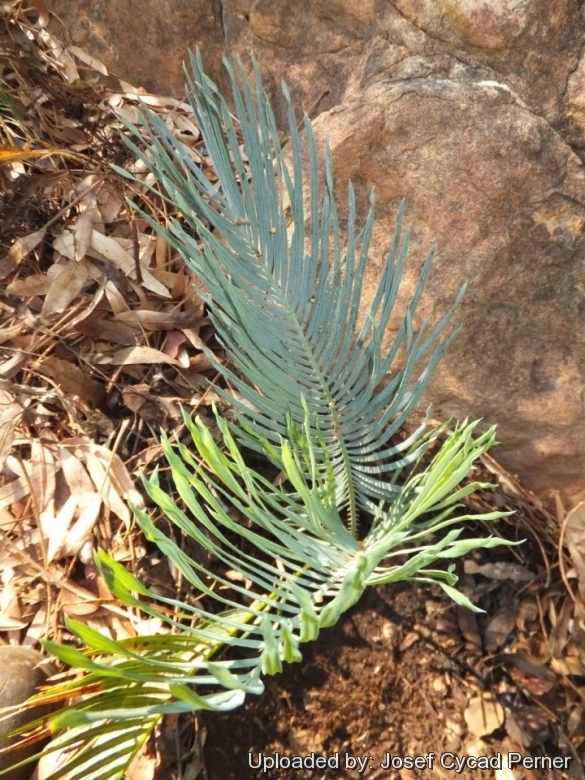 Palm and Cycad Societies of Australia (PACSOA) <http://www.pacsoa.org.au/wiki/Cycas_desolata>. 23 November 2013 Web. 28 August 2015. Cultivation and Propagation: Cycas desolata is suited to tropical regions which have a seasonally dry climate both on the seaside or inland. It is easy to grow, tolerating dry periods. It is still very rare but time by time seen in cultivation and sought after by collectors. Growth rate: It is a slow-growing species. Because of its growth habit, fertilize only when terminal bud begins to swell, indicating the start of the annual growth cycle. Exposure: Plant Cycas desolata in full to partial sun. Soil: Needs a well drained spot, with deep soi. Although this species naturally grows on coral-based or limestone soils with organic matter, avoid planting it in highly alkaline soils to avoid nutritional deficiencies and yellowed foliage. Hardiness: This is a tender evergreen species that is tropical in its needs. Pests and diseases: Watch out for scale infestations, especially Asian Aulacapsis scale, which will kill a mature plant if untreated. Maintenance: This is an evergreen species that should only have dead foliage pruned off, never the healthy green leaves. Propagation: Seed. As a slow growing plant, the seed can take from 6–18 months to germinate. After fertile seeds are collected, they usually need several months of storage before the inner embryo is ready to germinate. Therefore, it is best to clean the seeds of external fruit and set them aside before attempting to propagate the seeds. Usually seeds are ready to germinate after 2-4 month, the germination is rapid and almost all seeds germinate up within 2 month.